1. Before class glue two-12 oz. foam bowls together using 1" square pieces of fun foam. Place the bowls together one on top of the other. Glue the 1" square piece of fun foam to the edge of the top bowl and to the bottom bowl forming a hinge as shown in the picture at the right. 2. To make the handle cut 1"-slits about 1/2" apart all the way around one end of a paper towel tube as shown in the picture at the right. Fold out the cut tabs and place glue on each of the tabs. Press them down to the bottom of one of the bowls. If you don't have paper towel tubes, you can just roll up pieces of card stock or construction paper to make tubes. 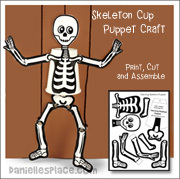 When children hold the puppet by the handle and move it up and down the mouth opens and closes. 3. Hair - You can use tissue paper or feathers for the hair. If you are going to use tissue paper, cut or rip it into 2" x 2" pieces. Pour tacky glue in cups. Show your children how to crinkle up the tissue paper, dip it in the glue, and then press it onto the top of a bowl to make hair. 5. Glue on googly eyes and pompoms for nose and ears. You can cut tongue shapes from construction paper or fun foam to glue inside the bowls. Your children may also want to add ears. Just follow the link and type in the appropriate number in the search box on the left to find the eyes. 6. Have your children cut teeth shapes from white card stock, construction paper, or fun foam sheets and glue them to the inside of the bowls for teeth. 1. Singing Puppet - Have your children make the mouth of the puppet open and close by holding the puppet by the handle and moving their hands up and down as you play "Brush Your Teeth" from the Singable Songs For The Very Young: Great With A Peanut-Butter Sandwich CD. 2. Study teeth, their names and placement and then have your children cut teeth from paper or fun foam and place them in the puppets mouth according to a diagram. 3. Learn about flossing - Give each of your children a piece of string and tell them to floss their puppets teeth. 2. Print out the bristle patterns and cut them apart. 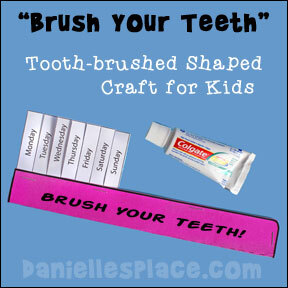 Place them one on top of the other and staple them inside the toothbrush handle. Staple or glue the rest of the handle closed. 3. Have your children write their names on the toothbrush book. 4. Instruct your children to take their brushes home. Every time they brush their teeth they should tear out one page of the book from the appropriate day. Tell them to bring their brushes back when they have torn out all the bristle pages. Note: Instead of having them tear out the pages, you can have them put stars on the days that they brush their teeth. 1. Read the Book "Tooth Fairy's First Night" by Anne Bowen. In the book Sally, a seven-year-old tooth fairy, is excited because it is her first night as a real tooth fairy. Her parents give her her very own tooth fairy purse and send her off with encouragement and reminders of the tooth fairy rules. When Sally gets to her first assignment she finds an unexpected letter. A clever little girl wrote the letter to find out if tooth fairies really do exist. The first note is just the first clue on how to find the tooth she has hidden somewhere in her room. Although it takes some time and patience the little tooth fairy figures out the clues and finally finds the hidden tooth. But the little fairy is as clever as the sleeping child. When the child wakes up she finds that the tooth fairy has left a note for her and that she has to go on a treasure hunt to find the tooth. 1. Reading - Have your child read the notes to the Tooth Fairy or pick out the words he or she recognizes. 2. 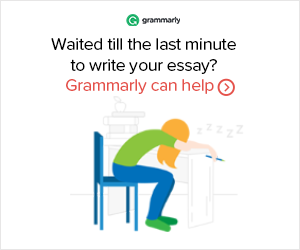 Writing - Help your child make his own tooth fairy treasure hunt. 3. Creative Play - Have your child pretend to be a tooth fairy. Hide a tooth somewhere in your house and make up a tooth fairy treasure hunt. Give him or her a small container to hold the tooth and the first clue, and then send him or her off to find the tooth. Nice Try, Tooth Fairy is created by a series of letters a little girl named Emma writes to the Tooth Fairy. She leaves her first tooth for the Tooth Fairy but decides she wants it back because she wants to show her Grandfather. The Tooth Fairy responds to her request, but keeps bringing back the wrong tooth, from very large rhinoceros' teeth to tiny skunk teeth. Each time the animal belonging to the tooth shows up in her bedroom, and Emma writes a letter to the Tooth Fairy requesting the right one. 1. Learn About Comparisons - This is a great book to learn about comparisons, big, bigger, biggest and the difference between different animal's teeth. 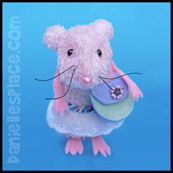 Learn about different "tooth fairy" traditions in countries around the world and make El Ratón Peréz, the mouse tooth fairy. Go to the Tooth Fairy Crafts and Learning Activities for directions. 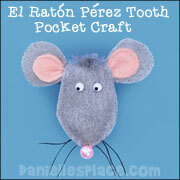 The Tooth Fairy and El Ratón Pérez show up at the same house and both claim the same tooth. In their fight to claim their prize, the tooth is lost and the Tooth Fairy and El Ratón Pérez have to work together to retrieve it. Spin the arrow and collect food to feed your toothy bowl puppet. If you land on "Sweet", you can collect a sweet, but you have to do ten pushups! The player that collects at least one item from every food group first wins. 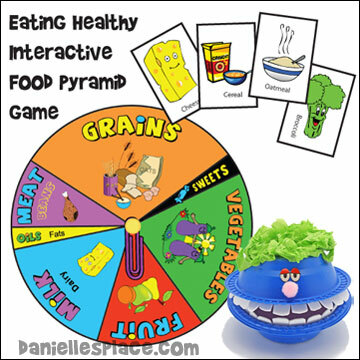 This game can also be used to review which foods belong to which food group and how much of each food group should be eaten. 1. 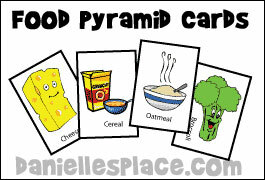 Print out the Food Pyramid Game Board and the cards onto card stock. 2. Cut the cards apart and cut around the outside of the Game Board. 3. Glue the game board to a piece of foam core board or a card board box. 4. Secure a paper clip to the middle of the game board with a thumb tack. The object of the game is to be the first player to collect at least one card from all the food categories first. Children take turns spinning the spinner. Each child selects one food card that matches the food category the spinner landed on. If a child lands on "Sweets", he or she must do ten pushups or other activity before collecting his or her sweet card. 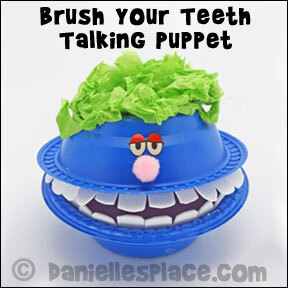 Have your children make the Toothy Bowl Puppet to store their food pictures. Children take turns spinning the spinner. Each child selects one food card that matches the food category the spinner stopped on, and places it in his or her toothy bowl puppet. If a child lands on "Sweets", he or she must do ten pushups or other activity before collecting a sweet card. If there are no more cards for the particular category that was spun, the child does not pick up a card on that turn. Keep playing until all the cards are gone. The child who collected the most cards wins. At the end of the game have your children sort all their cards into the different food groups. Teaching Heart.net - This web site has some great activities to teach children about dental health, the placement of their teeth, activities to teach them words relating to teeth, the effects of not taking care of their teeth, and much more. 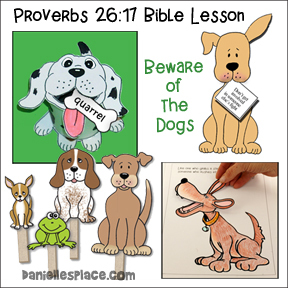 This 3" x 3" book has pictures and rhyming words that will help your children decipher the words. 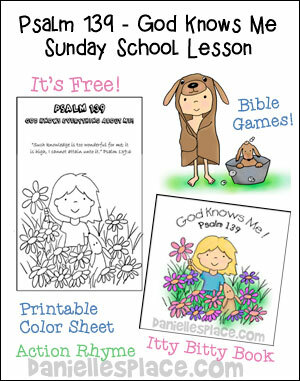 The God Made Me, Ears Sunday School Lesson for this mini book are available to members only on the members-only section.